I was up early this morning and thought about getting my favorite breakfast, do I really need to tell you the destination? While I was driving this morning and at the stop light at West 25th and Lorain, I just stopped and listened how quiet it was outside. Sure, there was the street sweeper cleaning up Market Square plaza around 7:30 this morning. It was a sign Friday night was over and a new day was ready to begin in earnest. At the West Side Market, the merchants already had their produce set up ready for the hundreds of people who will roam up and down the aisles looking for the best prices. There was an implied quietness there. No people yelling over other people this morning. Everyone was most likely pre-coffee and still trying to get their arms around the day ahead. A man stood outside of Bar Cento outside of the patio area. Last night, people having fun and socializing stood at the same spot but this morning, that space was his. He stood there by himself watching traffic go by. Not too many cars stopped me from getting to where I wanted to go. The lights on West 25th lazily changed from red to green, almost themselves realizing the work ahead after everyone got their morning routine under way. In front of the Old Angle, two people leaned up against the patio area there. I think the woman was waiting on the bus. She was dressed in a uniform and the man who she was kissing looked like he was waiting to see her off to her job. Cleveland was quiet this morning. Only two people waited on the bus down the street at West 25th and Detroit. It’s the bus stop where everyone seems to gather but no one actually gets on the bus. One man was inside of the bus stop and another man stood by the fence, both of them obviously counting down the moments until their transportation arrived. Just two cars drove up the Veterans’ Memorial Bridge, just 24 hours earlier, so many commuters would share the connection from Ohio City to downtown Cleveland over the Cuyahoga River. At St. Malachi, a homeless man curled up in one of the church’s entrances seeking shelter from any noise and elements. I wondered how long he had been there and the story of his life. The river was quiet this Saturday morning. No boats had signaled the Center Street Swing Bridge to do its job and allow traffic up the Cuyahoga. Of course, there were a fair number of seagulls who did not even care to disturb the peace. They were just looking for their breakfast and flying around trying to spot something to eat. Four cars sit right now outside of the Rock Bottom Restaurant & Brewery. The employees are already inside getting things ready for people once the city comes to life. It’s a cloudy day so far with the temperature of 65 degrees outside. There’s hardly any breeze to even make the trees make any noise. 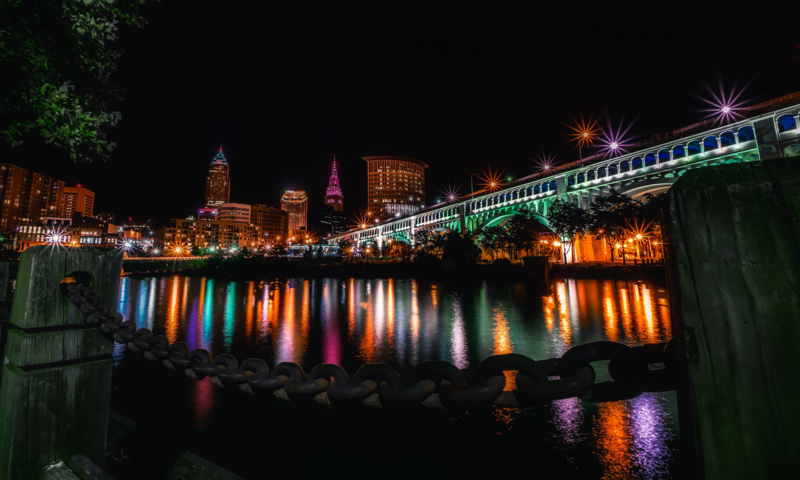 Cleveland is quiet just waiting to come alive… Downtown living, ain’t it grand? After having my birthweek off, I made it through five days at work. After almost two weeks, this cold/sinus infection/allergy/gunk that fills my lungs still hasn’t totally let up its chokehold on my body. I’m sure the lack of sleep and stress hasn’t helped my immunity’s cause. Now this weekend, I can relax… and relax, I will. Can I tell you something? There’s something to be said for a two person life. I have laundry to do, I have dishes to put away. I have shopping to take care of. I also need to relax. Everyone needs to take care of themselves every now and then. The focus needs to be shifted away from everything else and shined on themselves. You know what I saying? I can’t believe summer is over and fall is already here. It’s one of my favorite times of the year, it’s my mother’s least favorite times. I love the leaves, the apple cider, the county fairs (which I missed this year, there’s always next year!) and just everything else that means winter isn’t that far off. Call me crazy but I can’t wait for the first snow fall. Of course, I’ll be singing a different tune come March when I’ll be again longing for the summer. That’s the reason I moved back to Ohio from Texas. Down in the Lone Star State, you barely get your seasons. They’re something I’ve grown up with all of my life and I miss the changes in the climate and precipitation. Everyone loves a good snowstorm. Nothing quite brings people together. My (still) favorite holiday of the year happens during winter. Christmas is awesome and I can’t wait to see what this year brings. Weren’t we just talking about the weekend? How did I get myself already into 2009? Here’s to the future, just one day at a time.